Gleb Maltsev listens to around 900 speeches a year ranging from a 60-second pitch to a 45-minute keynote. He’s trained speakers for such pitching showcases as Slush, Latitude59, TechChill, and LOGIN. Here’s the fleece-vest-wearing elephant in the room that founders tend to ignore—the average European conference can have anywhere from 100 to 300 investors in attendance. Major ones like Slush and Web Summit have upwards of 1100–1500, with significantly more attending startups than investors by a ratio of 2:1. Each of those investors, ranging from a business angel to an associate or partner at a VC firm, in turn, might listen to around a 1000 pitches a year from pitching stages or in 1:1 meetings. Fifty of those will be delivered onstage at TechChill 2018. Yet, due to the gravitational pull of the power law, only a few of those companies are likely to get most of the funding. The odds with pitching clients are not much better. But hey, you’ve got the ‘rockstar’ team with an ‘unfair’ advantage, right? With that many stories chasing so many ears and term sheets, what all of those pitches share is less about the exponential ‘Hockey Stick’ growth curves and more about the exponential rate at which they are forgotten. This rate, aptly named the ‘forgetting curve’ was discovered by Dr. Hermann Ebbinghaus, a German psychologist with an appreciation for Byron’s “Don Juan“. He ran a study on himself by using nonsensical syllables, and tested it with a few verses from Byron’s 1819 poem—a work wildly criticized for its ‘immoral content’, and likely because of it ended up becoming ‘immensely popular’ in its day. The self-study has since been replicated by two Dutch researchers at the University of Amsterdam. What they confirmed was that close to 3/4 of your carefully crafted content will likely be forgotten on the sixth day, gradually plateauing at 80% by the end of a month. Provided the audience hasn’t been hitting those craft beers or artisanal gin the same evening or disrupting their circadian rhythm with too many flat whites and too little sleep. In that case, the curve is much, much steeper. Here’s what you can do to fight it and improve the odds of an investor, client, or a future team member acting on that memory. Every 50th word that male speakers—who can outnumber female ones by a ratio of 3:1 even at TED—use in conversation is either uh or um. It’s somewhat better for female speakers with every 69th word being more of an um than an uh, based on 11,972 recorded phone conversations in the US. This means if you’re speaking with an average rate of 120–150 words-per-minute, provided you’re not a news anchor, debater, or auctioneer—you’re likely to end up with two or three uhs or ums in there. With another two words going to disfluent repetitions such as ‘th-th-this’. Combined with such words as ‘er’, ‘like’, ‘so’, ‘you know’, ‘well’ it can at times take up upwards of 20% of the conversation. That’s also the time when your audience is reaching for their phones to see how many likes or emails they’ve received. That’s also the time during which they won’t be listening to you, and won’t be getting back. To practice uh–um–optimized–speech you’d need to stay focused during most conversations for at least a few weeks, be it a casual meetup or a matchmaking session with an investor. This doesn’t mean you need to remove uhs and ums completely—some of them do serve a role in turn-taking during a conversation—yet more than not, they’re a habit you can break. In the spirit of Charles Duhigg’s habit loop, your first cue will likely be a question or sentence that sparks your interest. That’s the moment to pause, breathe, and think. Once you’ve played through the sentence in your head, shoot. I’d even suggest making it part of the conversation by letting the other person know. Tell them that you’re building a new habit and could use a bit of feedback on your uhs. They could try it, as well. The goal is to bypass the temporary awkwardness and build a routine. The reward will come in the form of you becoming a better conversationalist, and a speaker that audiences want to listen to, and hopefully, remember. Now let’s add elevated levels of epinephrine to your first 3 minutes on stage. Those adrenal glands of yours might push you to speak at a rate of over 180 words per minute. This depends on how quickly you normally talk, which you can find out by transcribing a recording of your speech. Some, have the opposite effect of starting to speak as if they’re giving directions to a stranger, with a deliberate, slow and somewhat condescending tone. 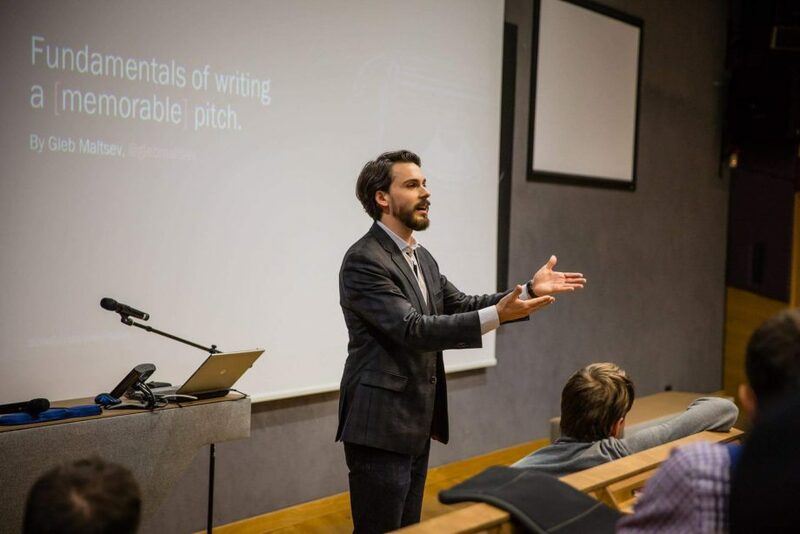 For most, though, it means that you’re going to be using a lot more words to say a lot less, with a higher rate of errors, and conversational filler—that distracts, confuses and leads to your pitch being forgotten. The obvious way to prevent it is to, well…slow down. When you’re at a loss for words, pause, breathe and think through what you are going to say next—before you say it. Yet all that adrenaline and the ticking timer are pushing you to speak at a rate of a semiautomatic. I’ve been there. It takes time—at least a few weeks of habit-building—to pause consciously. Especially on stage. The good thing about stress is that it’s super-effective at mobilizing you, yet it also doesn’t leave much cognitive resource for you to operate with. Just enough for fight or flight. Pick up a print copy of CoFounder Magazine’s 10th issue to read my stage fright first-aid kit, or see it on screen. To lower that cognitive load of delivering a talk, you need to write it out first. Try to go analog; screens tend to distract and prevent us from writing the way we speak. Pitching—unless you’ve been doing it for some time—is not improv. Audiences are somewhat understanding, and you might indeed get a polite applause by winging it, yet it’s unlikely to raise you a round. The common approach for many speakers is a partly-improvised talk. With it, they end up maintaining eye contact with a teleprompter-like set of slides, instead of their audience. That, too, is a fast-track to boredom and obscurity. The key point to keep in mind here is that having a script should not lead you to sound scripted. Racing through your text as if each word is a piece of paper being carelessly thrown over your shoulder is sure to get your audience to treat your talk just the same. A pitch needs at least 30–90 hours of work before being effectively delivered on stage. This depends on the length of your talk, and the complexity of your subject. The shorter the talk, and the more complex the subject, the greater the time that needs to go into writing and editing. Much of the work is about writing drafts and testing them out in front of an early audience at a smaller venue, such as a community hub or a co-working space. This needs to be done at least a few weeks before the main event. The ever-succinct Ernest Hemingway was once aptly quoted by his writing protégé Arnold Samuelson—“The first draft of anything is sh*t”. Sir Anthony Hopkins once awed director Steven Spielberg and his crew on the set of ‘Amistad’ by delivering a nuanced 7-page speech in 10 minutes—all in one take. How did he achieve this? Through cold-reading each line up to 300 times before delivering it on set, plus the ease to play with his lines that come with pages full of notes. Sir Anthony’s work ethic is admirable, yet a ‘memory palace’ technique could reduce some of that time. It dates back to the ancient Greeks and it can help you memorize your talk. Learning a text requires more than just mindlessly rereading it hundreds of times—it takes deliberate practice. Practice that is conscious of both delivery, be it about slowing down or emphasis—as well as writing and editing of your talk’s content in advance. It’s the kind of deliberate practice that has a feedback loop—preferably from a coach, your team, and hopefully a captive audience—someone that might remember enough of your story to share it a week, a month, or maybe at an annual shareholders meeting a few years from now. Every year Gleb coaches executives from almost every industry that would make the world a bit better, or at least have a shot at doing so. Around a 100 of those execs have gone on to pitch at trade fairs such as the Mobile World Congress, Smart City Expo, conhIT, boot Düsseldorf, Bygg Reis Deg, or BAU. Follow him @glebmaltsev for more pitching and speaking insights.